This post describes my family’s experience of going sugar-free, along with some strategies for other parents who are interested in reducing their own children’s intake of sugar and processed foods. It doesn’t come from a place of judgement or criticism – I am lucky and privileged to have been in a position to make this lifestyle change, so I would never judge another person, or parent, for their decisions. I’m aware that I’ve had the benefit of having young children (now aged 4 and 18 months), who can be easier to transition to a real food lifestyle than school-aged children. So I’m grateful to include throughout this post, contributions from my IQS mate and fellow Ambassador, Elise, who is a mother of three, aged 15, 12 and 8. Elise won the Instagram competition in the January round of the I Quit Sugar 8 Week Program, with her gorgeous and creative photos of her family’s sugar-free journey. I definitely recommend following her on Instagram at @healthyfamily5, and have included examples of her stunning photos at the end of this post. My parents’ and grandparents’ medical history includes diabetes, chronic kidney disease, heart issues and respiratory illness. Sugar has been linked to a number of chronic illnesses – click here for a brief overview of recent health studies relating to sugar. In the postgraduate public health subject I just completed, we learned about the slow onset of chronic illness, which occurs over decades, and is why children’s health and lifestyle can affect their future health as adults. But that’s just my family history. My children have the compounding influences of my husband’s family history too: more diabetes, more respiratory illness, and high blood pressure. Sometimes it seems as though our society ‘expects’ us to become sick as we reach middle-age, and I’m just not comfortable with that. Given our family history of health issues, and the long exposure to chronic illness, I hope that perhaps I can help to reduce the likelihood of my two little boys becoming sick later in their lives. Moving to a real food lifestyle has been rewarding for my family too. We all feel and look healthier. My Mother, who quit sugar after being diagnosed with diabetes, has more energy, and dare I say, zest for life. My husband has lost nearly 25kg. My 4 year old has less mood-swings over the course of the day, whinges less and is more willing to try new foods and eat his vegetables. So why do people feel uncomfortable with the idea of kids consuming less sugar? 1. That I am depriving my children of treats (and therefore, a happy childhood). I have to admit, I always found this accusation amusing, because I do give my children treats, both food-related and non-food related. Probably more than they should have! I just make my own, low-sugar, real food treats, like Georgia’s chocolate raspberry brownies. My boys’ understanding of treats doesn’t exclude healthy food, and they also regard frozen yoghurt, fruit (especially berries, which let’s be honest, ARE a treat just by virtue of being so expensive! ), smoothies and homemade popcorn as treats. My 4 year old picks a lolly from the cafe after his weekly swimming lesson. They still get Easter eggs, and go crazy at birthday parties (discussed further below). 2. That the most important thing is that children eat, SOMETHING, ANYTHING. I completely understand where this concern comes from, because I know how frustrating it can be to have a child who doesn’t want to eat (but who will miraculously find an appetite at McDonalds or for ice-cream!). The funny thing is, I have found that this problem has become less of a problem since moving to a real food lifestyle. This is in part thanks to a bunch of strategies provided by Well Nourished (more information below), and also because as the kids’ tastes have changed from preferring processed food couched in added sugar and salt, they have developed a greater appreciation for the natural flavours of real food. Although we still experience the “I don’t like vegetables!” wail regularly at the dinner table, they have expanded the range of foods they are willing to eat and enjoy (including vegetables!). 3. That children might develop food ‘hang-ups’ and body image issues. I understand that for many people, food and body image is intrinsically linked. Healthy eating has had a bad wrap recently, as some associate it with rigidity and strict rules, and even orthorexia. I never talk about sugar or food in relation to body image. I talk with the boys about healthy food which gives them energy and helps them to be ‘fast and strong’, and assists their bodies to work properly; and less healthy food that can make us feel tired, grumpy, and not that great. Personally, I found that eating real food gave me ‘food freedom’, and allowed me to let go of negative feelings associated with food, including guilt and anxiety. If I can prevent my children from developing a negative relationship with food, that’s a good thing. 4. That they won’t fit in with their peers. Truthfully, this is a tricky one for me. On the one hand, I feel that if we all conformed to everything expected of us, social change would never occur. On the other hand, as someone who was bullied at school, mostly for the terrible crimes of being smart and small, I can emotionally identify with the need for children to fit in with their peers. I really like Georgia’s approach to this issue, which relates to providing children with a level of autonomy and control around their food choices in social situations. When I take my son to the play-centre, and all his friends are eating rainbow ice-creams, of course I will buy him a rainbow ice-cream too, if he asks for one. He goes nuts on junk food at birthday parties (including his own party), and I’m okay with this, because I know these occasions are contextualised within a broader, nourishing diet. It will be up to him, as he gets older, to learn which foods make him feel good – ‘fast and strong’ – and which ones affect him negatively, and to negotiate how this works in social situations. Elise shares this view, regarding this process as a journey and learning experience for her children. She wants to support them to develop a positive view of food, without pressure. She also allows her children to make their own decisions at parties and friends’ houses, and is finding that over time, they want the sugary lollies and other treats less. As she says, “the process of quitting sugar is naturally happening”. No doubt I will experience new challenges when my eldest starts school next year, and starts seeing other kids’ lunchboxes! But I do believe that if I can nurture a love and appreciation for food, including preparation of food, and provide them with knowledge about why we like to cook and eat real food, they may carry this into their adult years – even if they lose it at various stages along the way. 1. Incremental change is key! It’s easy to feel overwhelmed by all the possible changes to be made. It’s been more than 12 months since I started on this path, and I am still making adjustments. Small changes, a little at a time, can help this process to feel more achievable, sustainable and rewarding. An early change for us, was to simply change our brand of peanut butter; from the usual brands full of vegetable oil, sugar and salt, to a 100% peanut-only butter (available in the spread aisle or the health food aisle of the supermarket). It tasted bland at first. But once our taste-buds adapted, we found it tasty and indulgent. Elise started transitioning her family to a low-sugar lifestyle through the IQS 8 Week Program, particularly by making family-friendly adaptations to the recipes; such as using familiar ingredients (e.g. potatoes and carrots instead of eggplant); and presenting unfamiliar foods in familiar ways, like serving the ‘curried mince’ in sausage roll form (see the photo at the end of this post). She finds that her 8 year old son is more receptive to ‘deconstructed’ meals with sauce on the side. I’ve found this also works for my small children, as it gives them the choice to decide which components of the meal they want to eat (rather than getting put off by the entire meal because of the shredded kale mixed through it! 🙂 ). 2. Don’t make a big deal out of it. I quietly replaced particular items with sugar-free variations, or made my own versions, and didn’t make a fuss. Instead of the ‘healthy’ cartoon-character yoghurts that I had been buying for years, full of added sugar, we started buying full-fat, sugar-free plain greek yoghurt. I served this with fruit puree and a little rice malt syrup, which I gradually reduced. Now the boys both enjoy it with chopped fruit and LSA mixture. Elise also ensures that sugar-free snacks are readily available for her children, without making a fuss. Changing just a few items can help. Rather than buy potato chips, I keep a bag of popcorn kernels in the pantry. Simply chuck a handful in a brown paper bag, scrunch down the top and microwave for two minutes, or until the popping slows. No fancy popcorn maker required! I sprinkle with cinnamon, or a little butter. Tomato sauce and BBQ sauce was another big one – I don’t have time to make my own, but found healthier versions of these sauces in the supermarket health food aisle, with no added sugar (or ‘numbers’) and sweetened only with stevia. Elise says that prior to participating in the I Quit Sugar 8 Week Program, she didn’t enjoy cooking much at all, and relied on processed foods and sauces. She found that it is possible and relatively easy to prepare nutritious meals from scratch. Although her family used to have Chinese, Indian or Thai takeaway once a week, she replaced this with a low-sugar equivalent, slow-cooker meal, or leftovers from the freezer stash. Providing ‘mini meal’ snacks was an important tip I picked up from Well Nourished, and also through my own experience with the I Quit Sugar program. I find that if I give the kids fruit only as a snack, or something sugary or highly processed, they will be back 20 minutes later, complaining they are still hungry. I try to include a source of protein and/or fat with all meals and snacks, and I find it does make them happier, for longer. I have included below a list of their favourite recipes and snack ideas. This is not a new idea, but that’s because it works! My 4 year old is far more willing to try something that he has helped to cook, even if it’s just stirring the mixture in the bowl or pressing the button on the food processor. My sister bought him a little chef hat and apron for his birthday, and he takes great pride in putting on his ‘uniform’ to help me in the kitchen! Elise also says that over the last six months as her family has made these changes, her 12 year old daughter has become more interested in helping out in the kitchen, and in choosing sugar-free recipes to cook for dinner. 6. Be consistent and don’t give up! It’s challenging. There are hits and misses. But it does get easier, and it’s rewarding! Just when it feels like I’m banging my head on a brick wall, my son will announce my pumpkin soup is ‘DE-LICious’, or explain to me that his vegetables help to make him fast and strong like Lightning McQueen. Although the progress can seem slow, it does happen. My eldest loves to help out in the kitchen, and it makes him more willing to try the finished product. Mr 4 made this chicken and mushroom carbonara “all by himself”. I did all the chopping, but he helped out with every other step, and consequently ate his whole bowl. He was also so proud to have made dinner for the family. Tasting plates: For lunches at home, I often give my kids a tasting plate of bits and pieces: cold meat or sliced boiled egg, cucumber slices, halved cherry tomatoes, grated carrot, cheese cubes, berries or kiwifruit, and corn on the cob. Sometimes I also add half an English muffin or crackers with nut butter. I leave it up to them to decide how much and what they will eat, and find that if I provide a variety, they are often tempted to try something new. Using an ice-cube tray is also a novelty for toddlers! Both my boys LOVE corn on the cob! Smoothies! I prefer smoothies to juice because they include the ‘whole’ fruit and vegetable, including the fibre, and they are a great way to sneak in some other nutrients. We use combinations of frozen berries, milk (dairy, nut or coconut based), chia seeds, LSA, cacao, frozen cubes of coconut milk and coconut cream, and soaked nuts or nut butter. Avocado adds creaminess, and berries can mask added greens, such as spinach. Both boys have taken a liking to fruit-free green smoothies, unaware they contain spinach and zucchini! Check out the free smoothie recipes on the IQS website for ideas. We also like the Gingerbread Smoothie. My go-to biscuits are these Hobnobs from IQS – I add peanut butter and dark chocolate chips. Don’t let them cook for too long, as they burn easily. ‘Berry Nice Brownies’ from Well Nourished, with hidden sweet potato. Hazelnut Orange Cupcakes, made with satiating nut meal and greek yoghurt. Choc-Toffee Popcorn Clusters – these are too hard for my 18th month old to eat, but Mr 4 loves them (and so do I…). Apple slices with cheese cubes, cream cheese ‘dip’ or nut butter. Cucumber and cheese ‘sandwiches’: My 4 year old came up with this one. He sandwiches a small slice of cheese between two cucumber slices, and will happily eat a plate of them. Rice crackers with nut butter and sliced banana or apple. Chia pudding: See this IQS Bluffers Guide to Chia Seeds for more information. Mango and Coconut Pannacotta from Well Nourished, made using gut-healing gelatin. Homemade microwave popcorn: Throw a handful of plain corn kernels into a brown paper bag, scrunch down the top and microwave for two minutes or until the popping slows. Add a little butter or cinnamon. Dark chocolate mousse, with hidden sweet potato or avocado (or both!). Hazelnut Nut-Ella Biscuits, inspired by I Quit Sugar. Visit ‘Recipes and Food’ on this blog for the recipe. The Raspberry Muffins and Oreo Cookies from the IQS Kids Cookbook (see her photos for these below). Sarah Wilson’s Inside Out Paleo Bread. Zucchini fritters (see her recipe for these in the photos below). These resources, some of which I’ve mentioned throughout the post, have been very helpful to me over the last 12 months, and are definitely worth reading and subscribing to. Georgia is a nutritionist and naturopath based in QLD. Her website focuses particularly on healthy kids, and she also runs a lunchbox challenge on Facebook during the school term. Click here for an overview of her main posts relating to healthy kids, including useful posts on family meals, snacking, and treats. I regularly make the delicious recipes from her Breakfast eBook, Rise and Shine, and I understand she will soon be releasing a lunchbox eBook. 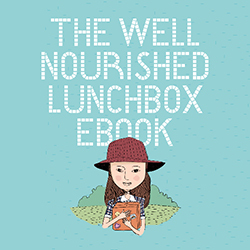 Update January 2016: Georgia’s eBook, The Well Nourished Lunchbox has been released! This blog was developed by Sha, a Melbourne-based mum to two children. Her website is full of sugar-free treats for kids and is searchable by ingredient (including excluding specific ingredients). The sugar-free spreads she puts on for her kids’ birthday parties are amazing. IQS have written about why kids can and should quit sugar too, and published a cookbook about it, available in hardcopy and as an eBook. They also provide some strategies to support kids to cut down on sugar. This fun and enlightening Australian documentary is available to own and rent, and provides an entertaining look at how pervasive sugar is, in nearly all processed foods. The documentary follows Damon as he undertakes a month-long experiment to eat only perceived ‘healthy’ foods, much of which contains added sugar. It’s a kid-friendly movie and very funny. View the trailer at the website, as well as recipes and other resources. David is the man who essentially started the sugar-free movement in Australia with his book Sweet Poison. This book inspired Sarah Wilson to quit sugar, and David also features as an expert in That Sugar Film. He has written extensively on the harms of fructose and seed oils, and provides regular research updates and recipes on his websites. He also maintains this handy product database, which summarises the fructose content of supermarket products and produce. Elise’s Gorgeous Photos – follow her at @healthyfamily5 for more! #leftovers Jo's curried mince made into sausage rolls for the #kidslunches tomorrow. #iqs #iqs8wp to be served with a side of tomato and capsicum #sugarfree 'relish'. There's so much you can do with leftover roasted vegetables. I've made 3 types of vegetable tarts using a low gluten flour and chia seeds from the Roast Beetroot, garlic and chia seed tart, recipe found on @iquitsugar website. Roasted pumpkin and sweet potato. Roasted eggplant and zucchini and roasted beetroot and onion. All topped with @mayversfood tahini spread mixed with lemon juice, feta cheese and #IQS za'atar. Lunch today is my favourite go to from the #iqs8wp @iquitsugar. Zucchini and Halloumi fritters. A great source of healthy greens, zucchini, mint and peas. My daughter is home from school with the flu, so I've pimped the recipe to include ginger, tumeric, diced onion and chia seeds. Served with avocado, tomato and capsicum salsa and topped with Greek yogurt. Tweaked recipe for Fritters makes 6-8: • 20g butter • 2 Large zucchini, grated (squeeze out excess moisture) • 1/2 cup frozen peas • 1/2 brown onion finely chopped • 1 glove garlic crushed • 100g halloumi, grated • 1/2 cup finely chopped mint • 1/2 cup gluten-free plain flour • zest of 1/2 lemon • 1 egg • salt & pepper Optional extras • 1 tbsp chia seeds • 1/2 teaspoon ginger powder • 1/2 teaspoon turmeric powder • Melt butter in frying pan. Add onion, garlic, zucchini and peas. Fry for 2-3mins or until cooked through. Allow to cool. •In a bowl add halloumi, mint, flour, zest, egg, seasoning, cooled zucchini mixture and any optional extras. Combine well. •Add butter to frying pan and add tablespoons of mixture. Turning to cook each side. Wow! Very informative. Thank you. You’re very welcome, and thanks for the feedback! It’s definitely an ongoing journey – even three years on for us. I still have those days when I feel like I’m banging my head on a brick wall! But looking back I can see we’ve actually come a long way. Good luck with the 8 week program!